The History of Tasco Blocks and Pavers Coming from humble beginnings, Tasco Bricks (as it was originally known) started in a small shed in Somerset on the North West coast of Tasmania in the late Eighties. The company started supplying the housing market on the North West coast with concrete bricks from a hand press, using the local phone box as an office. Committment to providing High Quality Bricks and Pavers As the business grew and building practices changed, Tasco was relocated to the current site at Round Hill, Burnie in 1997. An automated concrete block machine was installed to allow the production of concrete blocks and pavers. Tasco Blocks and Pavers, as it is known today, changed ownership in August 2008 as Chris and Nicola Kelly took over the business. One of the main strategies Chris and Nicola have adopted is to capitalise on the strong name Tasco Blocks and Pavers has developed, and to grow the business through a continued dedication to high quality products and service. Introduction of Tech-Dry The name Tasco has enjoyed a long association with the revolutionary water repellant additive "Tech-Dry", being the first concrete masonry company to release a Tech-Dry product into the Tasmanian market. 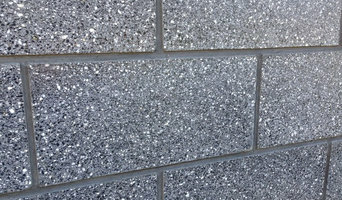 Tech-Dry is used in all Tasco paving and retaining wall products for the control of Efflorescence, (white salts) and in selected grey block ranges for water repellency. Tech Dry has become an integral part of the production process at Tasco, and has been incorporated into new product development such as the new Signature Series - Architectural block range. A Central Coast, Tasmania stonemason can add kerb appeal to your home and is usually hired for home projects such as driveways, pathways, pool coping and home facades, but can also build retaining walls and fit stone cladding. In some instances, their work can extend to features inside the home, from fireplace surrounds and mantels to staircases. Find a Central Coast, Tasmania stone, paver and concrete professional on Houzz. Scroll through this page to find a stonemason, paver or concreter in your area. Just enter your suburb in the top field to narrow your search. You can browse their latest projects, read reviews and see how other homeowners rate their work, and message them directly.